Microsoft’s security updates make the Windows 8 OS one of the strongest in recent years. At the same time, this OS will be a target due to its adoption and popularity. Today’s threat landscape hides an ever-changing stream of worms, spyware, Trojans, bots, rootkits, hackers, identity thieves, and targeted attacks. These threats affect users who expect to take work with them everywhere, unknowingly jeopardizing your network and systems when they return to the office. 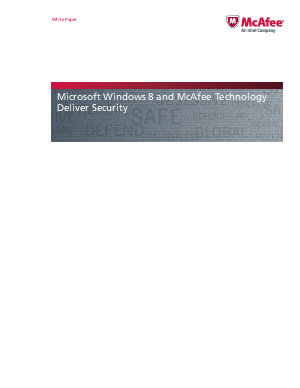 Proactive and comprehensive protection technologies require that we take advantage of OS updates and have the understanding of attack vectors and processes to make Windows 8 as safe and secure as possible.